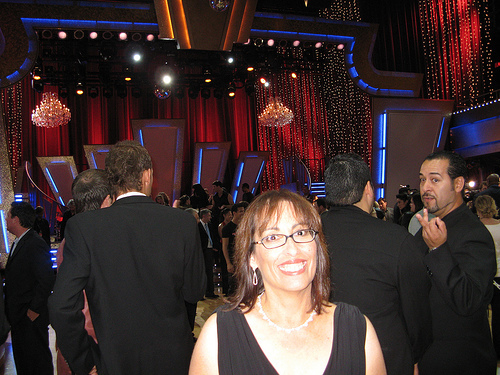 Dancing With the Stars sponsor AT&T invited me to attend tonight’s show taping. I have attended tapings before (thanks to my friend, Mary Ellen, who works on the program). They’re fun, they’re free, and if you are lucky enough to score a VIP ticket, they’re a great excuse to get dressed up (because the show’s producers want the audience to look classy). AT&T wants everyone to know about their DWTS Facebook event and digital pre-show. I RSVP’d to the company’s invitation about a month ago, and both my husband and I had been looking forward to it as something we could enjoy together without breaking our budget. All right, I did go out and buy myself a new dress last night because I’ve gained so much weight that the old one doesn’t fit any longer (and that one was purchased five years ago, after I LOST 56 pounds). And this is why I jump on events like the DWTS invitation: there was a time when I did not think twice about buying myself something nice to wear, and owned a wardrobe with multiple items to choose from. There was a time when my husband and I habitually dined out together and did things just for fun. There was a time when we lived our lives at a slower pace. That was a good time. And I have to remind myself that my life was once like that, so maybe it can be that way again. But not now. Now my mantra is “austerity,” and I’m sick of it. I’m tired of pinching pennies (unsuccessfully, because I’m not very good at it). I’m tired of living in t-shirts and jeans. And I’m really tired of trying to cram too many activities into too few hours, every single day. I never succeed in getting all of them done, and one item or another always needs to be postponed or canceled entirely. I’m especially tired of being unable to predict how much I can reasonably accomplish. I try only to accept invitations to events I will attend. And yet, I manage to flake out on about half of them. It’s always something: Most often, it’s just me working slower than I expected and being in danger of missing a deadline. Sometimes it’s a scheduling conflict with another family member. That’s what happened today: my husband is swamped at work and could not really take the afternoon off to attend DWTS — and he was my ride to the show, as my daughter took my car today. I will be returning the dress tonight, after the kid comes home with the car. I debated keeping it, because I really do need to own a dress that fits. But on Monday, I’ll be starting yet another new diet. And if it’s successful, I may be able to slip into the old one again. DISCLOSURE: I did not receive any compensation of any kind in exchange for writing this post. Boo! I am so sorry you missed a chance to get dressed up and go out. I know those occasions come around rarely, and I know what it’s like to be excited about them. I do like your attitude taking the dress back with the hopes of losing weight and fitting into a smaller size. Good way to turn the situation around. Wishing you luck on the diet, and I hope you and your husband can at least find some time to do something nice together soon!